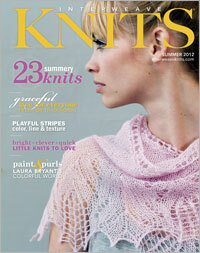 The latest issue of Interweave Knits arrived in my mailbox today! Love the shawl on the front - it is the Summer Blooms Shawl, designed by Susanna Ic and knit with Suri Elegance. Several other very nice projects in this issue, as well as an article on swatching, by Eunny Jang. Check out the link above to see all of the projects in this issue!